Sacred Heart Schools completed construction of its Stevens Library for lower and middle school students in August 2012. The library is a 6,300 ft2 all-electric building. It was designed and constructed to achieve Zero Net Energy (ZNE) performance--based on total site energy), to meet the Living Building Challenge and attain LEED Platinum certification. The design includes many energy efficiency and high performance features to achieve these goals, including mixed mode natural ventilation design, an electric heat pump RTU, high performance glazing, efficient lighting and controls, high thermal resistance cool roof, variable speed split system conditioning, direct/ indirect evaporative cooling, ceiling fans, and significant energy sub-metering. 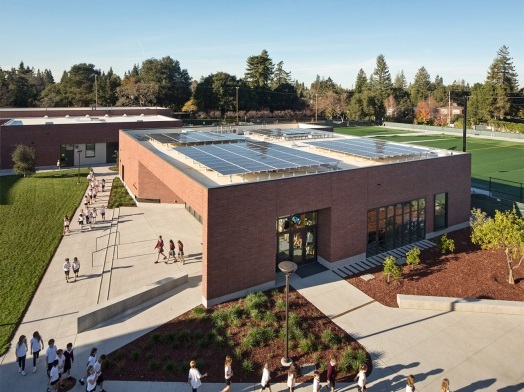 The objective of the ET project is to evaluate how the Sacred Heart Schools Stevens Library performed with respect to its zero net energy design goal, and to identify issues, challenges, problems, and lessons learned to inform and guide the design of future ZNE buildings.